After last months less than successful film review, I was a bit nervous while choosing the film for this month, but settled for Scooby Doo Spooky Games on the basis none of the children would even imagine for a second I would watch it with them, whereas they might think I would go for a Dr Seuss recycling monster. It arrived while we were on holiday, so last night I invited an extra child round on the basis she might have something positive to say out of obligation… and left them to it. The basic premise here appears to be a set of episodes of which one is a Scooby themed London Olympics (are we allowed to type that yet?) episode where Shaggy finds himself running in the Olympics while Fred pole vaults for King and country to show off. And it's all in American accents. (I don't think the children noticed that and I was at a distance large enough to allow me to live with it). And it made them laugh a lot, which is always a good sign. There is another episode which combines all sorts of cartoon characters in it, including Yogi and the Pink Panther. Both 12 year olds gave it 8 out of 10, knocking off a point for a lack of Smurfs, but conceded that was probably due to them being involved in making their own film currently. I don't know what it is, but I love a bit of cross cartoon pollination. It's a bit like Doctor Who (DT, natch), Sherlock and Sam from Life on Mars all simultaneously appearing in a Children in Need special. *stops…. drools… continues…* It truly tickles my girls fancy whenever two unlikely hand drawn characters appear on the same screen. Maddy agreed but said that as Scooby, Yogi and the Pink Panther are her equal favourites, it was impossible not to like. With thanks to the Tots100 Film Club. Making some noise with Lego Friends. Josie was very lucky to be sent some of the latest Lego Friends range to review. Despite some of the initial household raised eyebrows about pink Lego in our house and on the Internet a large, Josie was so pleased with the last little set she received that she blew some birthday money on more of it. So getting a fresh set, in the shape of Mia’s musical bedroom the other day was a major bonus. Well, hello… Somebody has issues! Bizarrely enough, I’ve never read the book. I can picture it very clearly on the shelf of my classroom at school but I was such an early reader that I turned up my nose at books with pictures. We’ve never had it in the house for the girls either. I don’t know why (it may be partly that I hate picture books a little bit to be honest) but it sits alongside Each Peach Pear Plum in my head as a classic I have never read. On the evening I gave the girls the film to watch, Bene was being hideously fussy. I assumed, because the tend to quite like fantasy, they’d love it. I didn’t get to sit in the room with them because I had to quell a ferocious beastie of my own so I have to review it by proxy. That would be an excellent way to describe it if proxy meant ‘shoe horn comments out of children by coercion and threatened supper less nights’. The story is of a boy (Max, yes, could be worse dear, I’ve met plenty of Alsatians with your name too) who is sent to bed without supper for misdemeanours involving a wolf costume (I got that bit from the Internet, the children were hazy on the details) and goes off into an imaginary land where he stares down monsters and becomes king before coming home to bed. I would imagine he’s improved by this experience. I am going to watch the film though, just to check. The girls said “it was quite good that they made a film out of a short book but not enough happened” and followed that up with ” the special effects were good but it all felt a bit dark”. Maddy said “it was very good at making you feel like you were really there, the atmosphere was exactly how it should be for the story… It’s just I didn’t like the thought of being in it”. Fran said “I should have done something else” but she is 14. Overall opinion was that had they been younger boys who had read the book, they might have liked it more. Sigh. We are, even if it is not immediately obvious, very grateful to have had the opportunity to review this film thanks to the Tots100 Film Club and very much appreciated being sent the DVD for free. I suspect my nieces will be gratefuller. 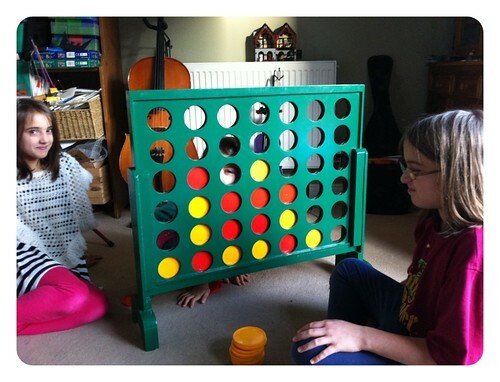 I’m not entirely sure why we don’t have Connect 4 in our arsenal of games at home; we definitely did, but I suspect it may have fallen victim to the plague of hapless and untidy girls over the years. It’s a shame, because it has to be the simplest and cleverest game there is – noughts and crosses mark 2 really – and even I like playing it. It’s one of those games that has lots of plus points; it is very simple even for little ones, it is quick and it teaches strategy and looking ahead. What surprised me was there was a lot of fun to be had from a jumbo sized set (ahem!) There were tournaments and hilarity and there was laughter and family fun. It pulled a lot of strings and has been played far more than a small set would have been. I like the look and feel (though I admit I miss the bobbled edges of the same sized pieces). Josie started off by wailing and losing every game but, as you can see from this game, has learned a lot. That’s her peeping delightedly through having just totally cornered Maddy and beaten her. I think this would be lovely for a house with a big garden or one with lots of visiting kids; it’s a great summer party game, but would equally suit a childminder, a nursery or a school. I think we’ll probably pass this on to a local kids group eventually, but right now I don’t stand a chance at parting them from it – it’s much too popular! Disclosure: we were sent this game to review for free. All opinions are genuine and my own.